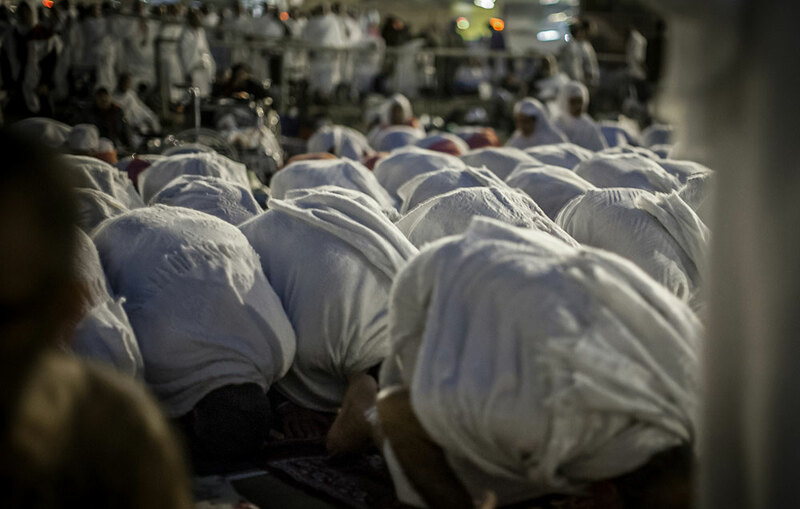 But when you depart from Arafat, remember Allah at al-Mashar al-Haram. And remember Him, as He has guided you, for indeed, you were before that among those astray. After sunset, the Prophet ﷺ departed Arafat. Upon arrival at Muzdalifah, he repeated the Talbiyah and performed Wudhu. The Prophet ﷺ offered the Maghrib and Isha prayers together at Jam (i.e. al-Muzdalifa) with a separate Iqama for each of them and did not offer any optional prayer in between them or after each of them. Ibn Umar reported that Allah’s Messenger ﷺ combined the sunset and Isha prayers at Muzdalifah. 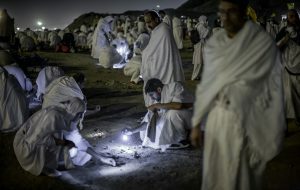 He observed three Rakats of the sunset prayer and three Rakats of the Isha prayer with one Iqama. We got down at Muzdalifah and Sawda asked the permission of the Prophet ﷺ to leave (early) before the rush of the people. She was a slow woman and he gave her permission, so she departed (from Muzdalifah) before the rush of the people. We kept on staying at Muzdalifah till dawn, and set out with the Prophet ﷺ but (I suffered so much that) I wished I had taken the permission of Allah’s Messenger ﷺ as Sawda had done, and that would have been dearer to me than any other happiness. The Prophet ﷺ woke up at dawn and led the Fajr prayer. He then mounted his she-camel, al-Qaswa, and proceeded to al-Mashar al-Haram where he praised Allah and supplicated to Him. After that, he picked up seven small pebbles and left for Mina before sunrise. He continued to recite Talbiyah during this journey. 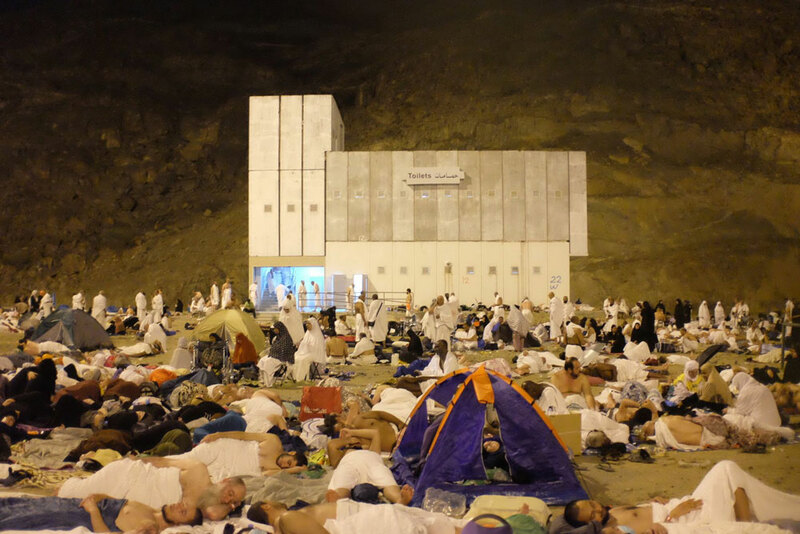 At Muzdalifah, you will stay under the night sky. There are no tents or other accommodation facilities here. Although there are plenty of lights, it is still fairly dark and can prove quite difficult to distinguish between people. As soon as you disembark the coach, stay near your group. If you are a woman, ensure you stay with your husband / Mahram and do not wander off on your own. Toilets and Wudhu facilities are available, but they will be crowded so patience must be exercised here. Sometimes, pilgrims are forced to use the bushes / mountains due to the long queues. It is for this reason that you are advised to use the toilet before you leave Arafat. The boundaries for Muzdalifah are indicated by large purple sign posts. There is also a mosque in Muzdalifah known as Mashar al-Haram, which is on the site of what used to be a small mountain. If you get a chance after Salah, go for a walk around Muzdalifah. 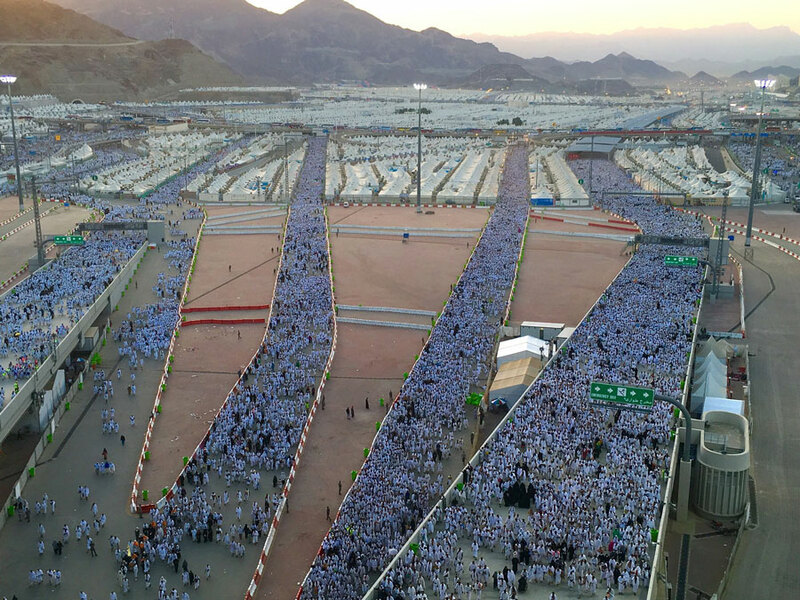 The multitudes of people within Muzdalifah is certainly an amazing sight. However, make sure you don’t get lost. Take great care in Muzdalifah. It’s a good idea to always carry a mobile phone and a torch (flashlight) with you. 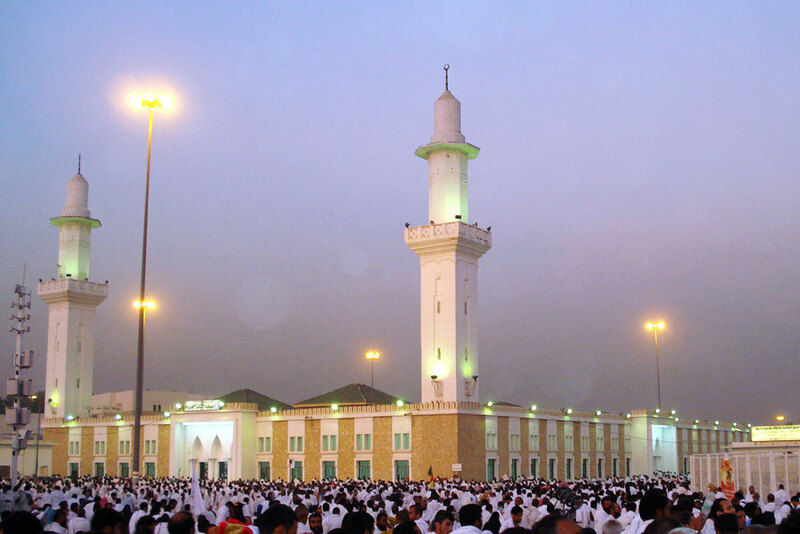 Maghrib and Isha, in the form of Qasr, will be performed together at the time of Isha. If you have arrived in Muzdalifah early, you must wait until the time of Isha comes in before you can perform the prayers. If Isha Salah is performed first, it must be repeated again after Maghrib Salah. Iqama is made for Maghrib. Takbir is made for Maghrib Fardh Salah and three Rakats are performed. After the prayer is completed, while standing, recite Takbir al-Tashreeq. Iqama is made for Isha Salah. Takbir is made for Isha Fardh Salah and two Rakats are performed. After the prayer is completed, recite Takbir al-Tashreeq and Talbiyah. No additional Nafl (optional) prayers are performed before or after these prayers. Witr Salah is performed thereafter. Please note, if you are still in Arafat, stuck on the coach in traffic or making your way to Muzdalifah and you fear that the time of Isha will expire causing you to miss the prayers, the Maghrib and Isha prayers should be combined and performed on the way to Muzdalifah. 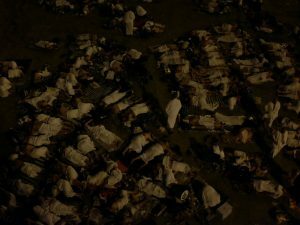 Generally, if you haven’t reached Muzdalifah by night, perform the prayers in the position that you are. Remember the time for Isha doesn’t last until Fajr. Rasulullah ﷺ made concessions for individuals who were regarded as weak, such as women, children, the elderly and infirm, to leave Muzdalifah for Mina between the time of moonset and dawn. However, women should endeavour to remain in Muzdalifah as Rasulullah ﷺ had done, especially if your husband / Mahram is to remain there overnight. Unfortunately, many pilgrims who don’t fit the criteria that were specified by Rasulullah ﷺ choose not to stay at Muzdalifah and to return to Mina during the night, whilst others disregard Muzdalifah altogether. If your circumstances aren’t preventing you from reaching and remaining in Muzdalifah, as is sometimes the case, then you should do all that you can to fulfil this Sunnah and gain immense reward. 7 for the 10th of Dhul Hijjah. 21 for the 11th of Dhul Hijjah. 21 for the 12th of Dhul Hijjah. It is advised, however, that you pick up a further 21 pebbles as a precautionary measure to bring your total up to 70. 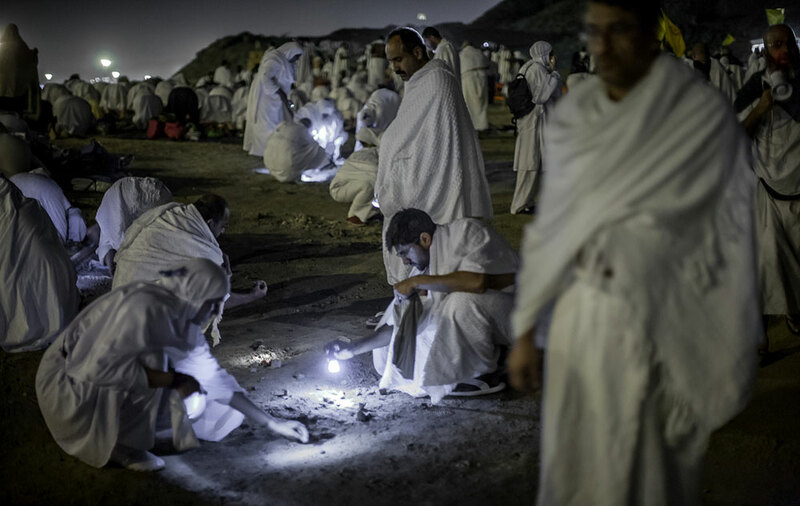 When you’re throwing the pebbles at the Jamarat, you may miss the target or some pebbles may fall from your hand. It’s better to have more than to have less. It is a Sunnah to collect the pebbles in the morning as Rasulullah ﷺ had done, although collecting them during the night is also perfectly acceptable. Walk to the foot of the nearby hills to find pebbles. Pebbles should be about the size of a pea; anything beneath or exceeding this size is not desirable, although still accepted. Collect the pebbles from a clean place. Don’t collect pebbles lying around the bathroom facilities. If there is no filth on the pebbles, assume they are clean and don’t need to be washed. If the pebbles are visibly dirty, they should be washed. You can help one another find pebbles; it doesn’t have to be an individual endeavour. Put your pebbles in a pebble bag you have bought with you specifically for this purpose. If you don’t have one, you can use a small, empty water bottle which also works well. Ibadah – Spending the night in worship is recommended and full of blessings. Rest – Get some well-needed rest in preparation for the next three days of Hajj, as was the practice of Rasulullah ﷺ. Finding a space to sleep can initially prove quite troublesome, due to the sheer number of people. If you do find a space, make sure it’s with your group. If you have brought a sleeping bag with you, now would be the time to use it. If you didn’t bring one, you should be able to buy a cheap mat, inflatable pillow and a blanket. It is advised that you keep some water with you to perform Wudhu for Fajr Salah unless you’re close to the washing facilities and are happy to use them. It is Sunnah to perform Fajr Salah at the earliest part of dawn whilst it is still dark. Fajr in Muzdalifah is approximately five minutes after the time of Fajr in Makkah, so make a note of the Fajr Adhan time in Makkah beforehand. You may also hear the Adhan from the Masjid in Mashar al-Haram. It is also a Sunnah to perform Wuquf in Muzdalifah after Fajr Salah, even if it’s for a moment. Dua should be made in the same manner as Arafat i.e. standing while facing the Qibla. 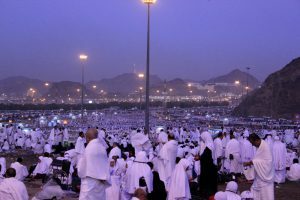 Make strong supplications here, like you did in Arafat, as Duas here are accepted. You shouldn’t leave Muzdalifah before you have completed your Wuquf. If you’re being ushered to your coach by your tour operator, your Dua can be made while you wait in the queue for your coach. It is not a necessity to raise your hands or stand while making Dua if it is not convenient to do so, although there is greater reward in standing. The distance to your camp in Mina is about 3 miles (5 kilometres) away from where you currently are so it is advised to wait for a coach. Exercise patience as you wait for the coach to leave Muzdalifah. The walk back to Mina can be quite strenuous and you may get lost on the way. However, if you do decide to walk, it’s advisable to camp near the border, so it’s a shorter distance to walk to Mina. The duration of the walk should be between one and two hours. If you camp further away, the walk could last more than two hours. Ensure you leave soon after you have done Wuquf and made your supplications. It is the Sunnah of Rasulullah ﷺ to leave the boundary of Muzdalifah prior to sunrise. The sooner you leave, the more likely you are to avoid congestion. Don’t spend too much time having breakfast and remember to continue reciting Talbiyah on the way. Perform Dhuhr and Asr in Arafat. Proceed to Muzdalifah after sunset. Perform Maghrib and Isha at Muzdalifah. Collect 49 – 70 pebbles. Perform Fajr Salah and make Dua. Proceed to Mina before sunrise.